Making sure that children have a good sounding in maths is essential. 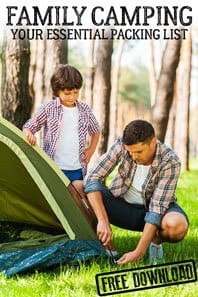 Without the basics they will struggle later on and the easiest way to make sure that they don’t find it difficult is to make the early learning aspects of it fun and hands-on. 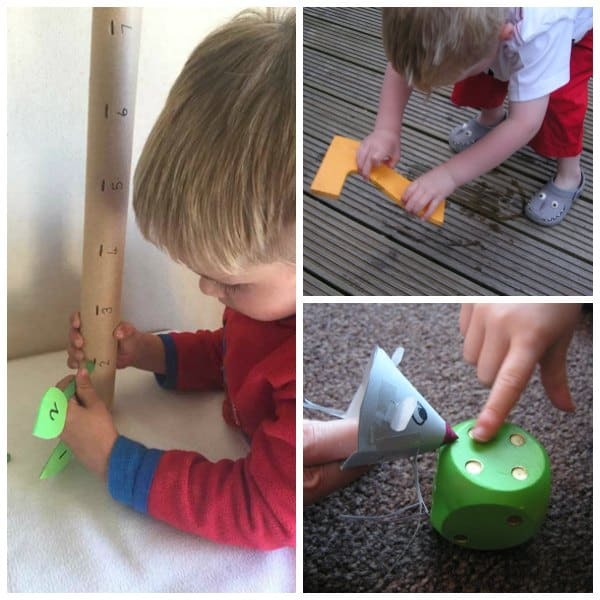 Playful Maths or Hands-on Maths Activities are a great way to help support children in these early years get a grasp of the basics like counting, 1 to 1 correspondence, number recognition, shapes, colours, simple addition and subtraction, positional words, comparison, measuring and sorting. 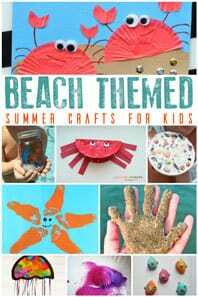 There are so many ways to incorporate these into your home or setting and you can easily theme to make them interest for different children at different times during the ages of 2 to 5. 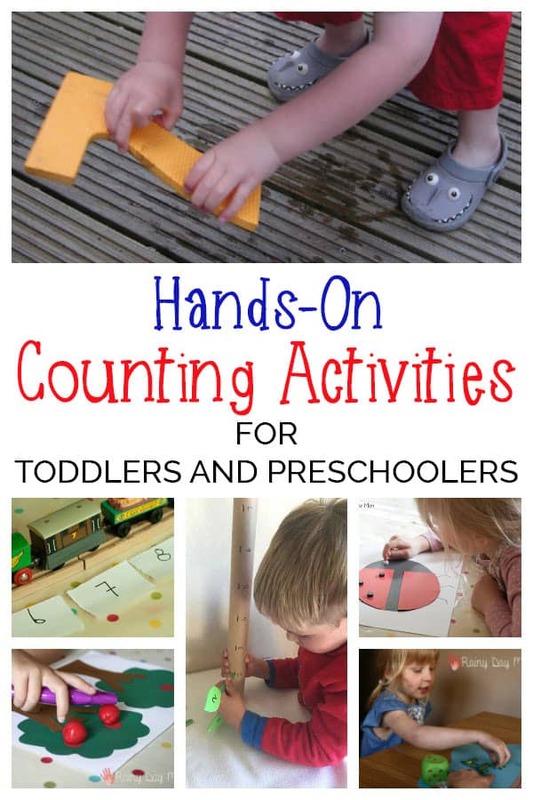 We’re starting off with a focus on Counting here’s some suggestions for counting, 1 to 1 correspondance, number recognition and starting to develop addition and subtraction all through Maths Games for toddlers and preschoolers. 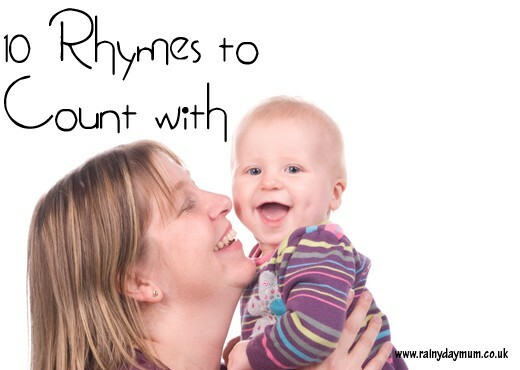 Learning to count is the area of maths that most parents focusing on first, through rhymes and books. 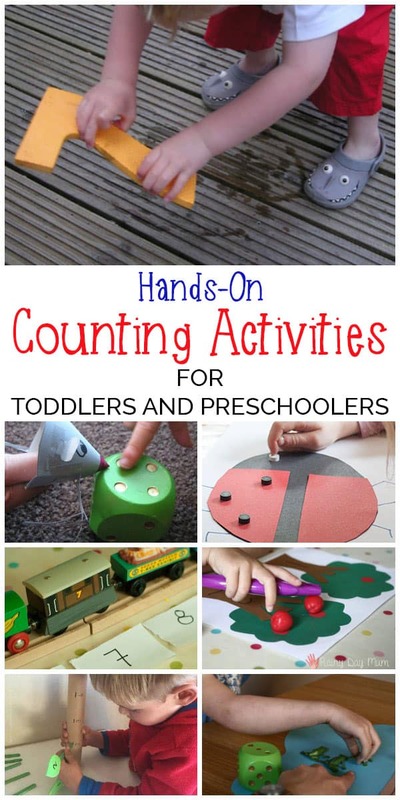 These counting songs for kids are perfect for having fun and introducing numbers forward and backward for toddlers and preschoolers. There are lots of fun ways that you can work on counting out different objects at different times of the year. Here are just a few ideas for some seasonal counting activities. After a visit to the farm to see the Spring Animals you could count out the animals in the different areas with this simple to create Farm Counting Game – for older children you could introduce addition and subtraction with the farm animals. With one of our favourite counting rhymes being 5 little speckled frogs this frog counting game is perfect for any spring or even life-cycle themed mathematics for little ones. Clip cards are great for working on fine motor skills as well as being used to count with you can adapt them however you want and even create your own versions with no printing involved. These Snowmen Count and Clip cards are an easy DIY and you could use them for Christmas or Winter themed maths. 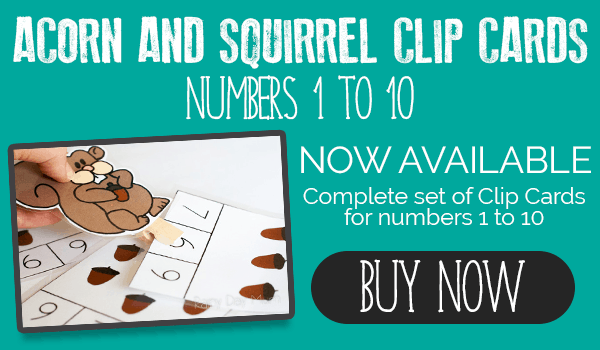 If you would prefer some ready made that you can download and print then use with your children the Acorn and Squirrel cards are ideal for autumn maths. Another count and clip cards that we love are the Over in the Forest set. 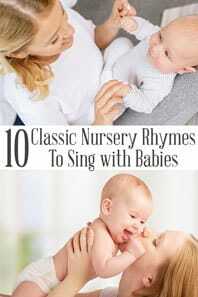 With a fun book that if you are feeling a little musical you can sing along with the counting words as well. Another fun autumn maths activity that works on number recognition and counting is this DIY pumpkin patch. 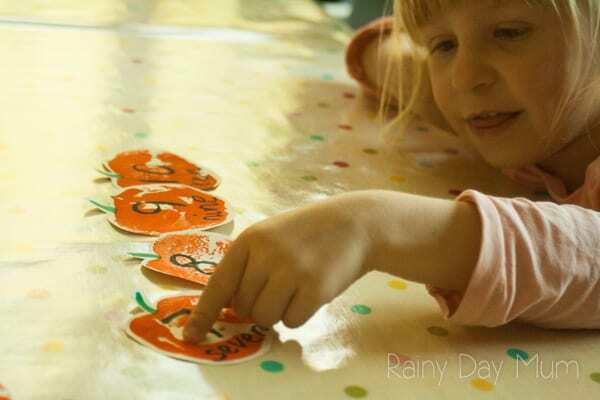 Easy to make and you can use it for counting out the pumpkins as you pick them through to recognising the numbers and even older children could pick two pumpkins and add the numbers together. Another pumpkin themed activity a DIY number line for toddlers and preschoolers to create. 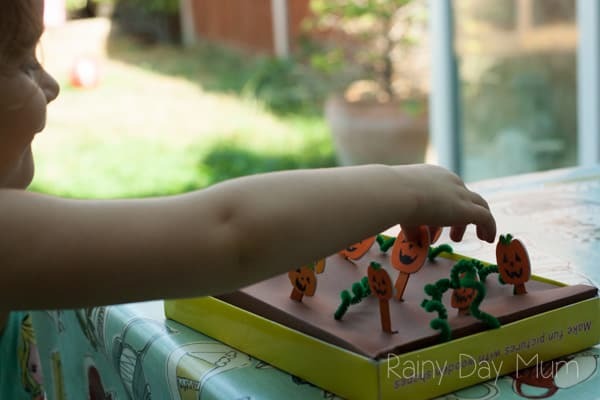 Another autumn themed counting and number recognition activity Apple Tree Maths – so simple to make and is ideal to set up as a tray that can be brought out regularly during the early autumn months. Matching up numbers is a great way to introduce how numbers look to children so that they can recognise the difference between the squiggles – this acorn and acorn cup matching game is a great way to start and then you could move onto sequencing the numbers. Recognising the numbers is another goal by the end of preschool and you can get really inventive with it on a small scale you could use the pumpkin number line shown above or you could go a little bit bigger. 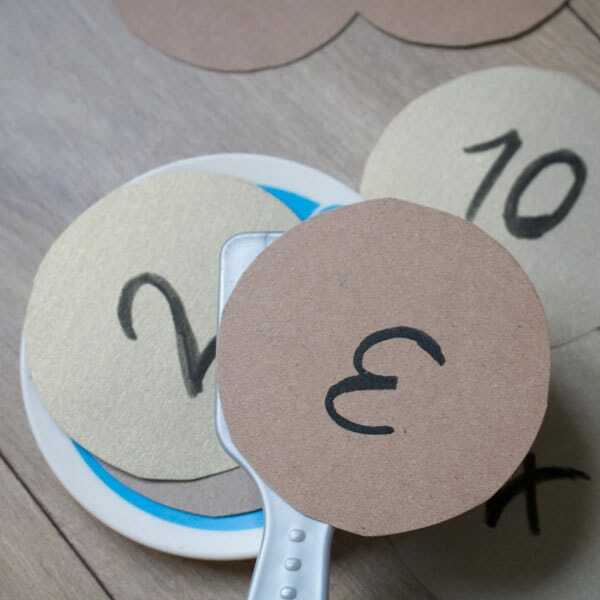 This backyard number hunt with foam numbers is great for getting kids moving and finding those numbers once they have the numbers then they can use them to make some number prints that are mess free! 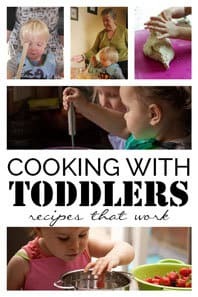 Recognising the relationship between dots on a dice and the number that they represent is another skill that toddlers and preschoolers work on through games and activities this If you give a Mouse a Cookie game works on this and counting as well. 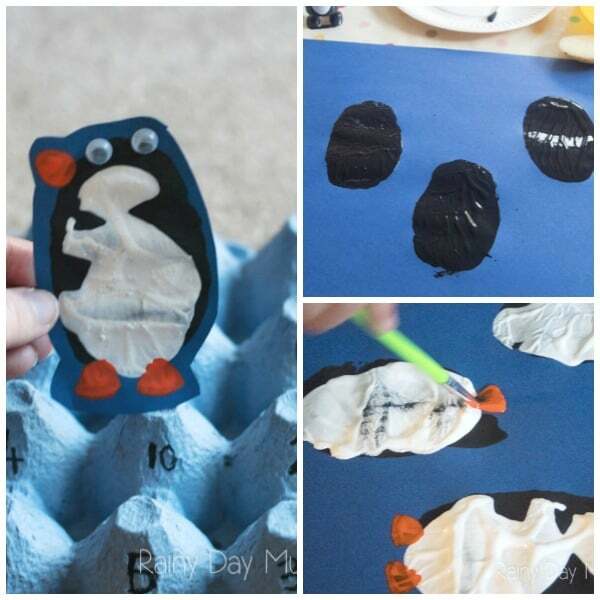 Penguins are among our favourite animals and this DIY counting game is perfect for Polar or Winter themed maths, plus your child can get a little creative making their own penguin to play. 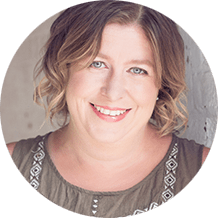 I love connecting books and activities and a storybook curriculum would be my ideal method of teaching preschool. This count and climb Jack in the Bean Stalk activity is so much fun to make and play with and connects a favourite classic tale for children as well as supporting their learning. 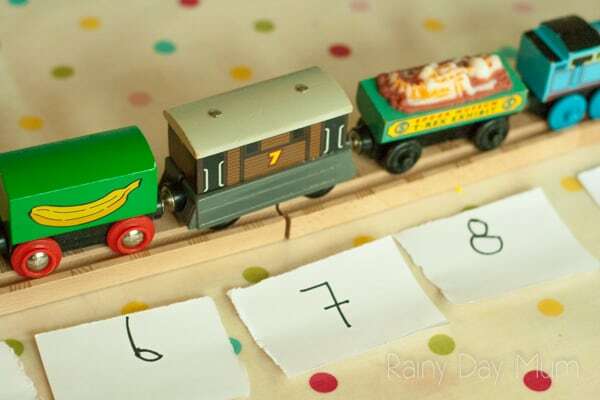 Counting on and backward is another skill that preschoolers will need to learn, and this train themed activity is great for counting forwards and backward using this playful number line idea. Inspired by If you Give a Pig a Pancake by Laura Numeroff we are stacking pancakes in number order and counting on and back as well as looking at odd and even numbers. Once your preschool has grasped the basics of numbers then to prepare them for Kinder you can start introducing the concepts of addition and subtraction. Ladybirds are fun to work with as you can also introduce the concept of doubling. 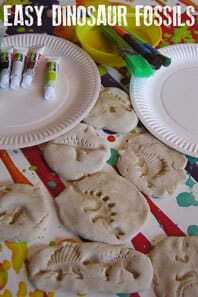 Why not make paper ladybugs and do match the number of dots on both halves or use playdough to do it.